julie,,please don't take this the wrong way but dum dum puts the fear of god in me. Good morning Julie and fred. Are we down to just freds in the comments? it's a festival of Freds! you can give the Davids a run for their money! We need a couple more than you can do the freddy! Accu-Playlist ROCKS! I find myself checking basically every song... thanks for doing the bookkeeping, Mlle. DJ! It'd be a festival of peace! You'd need some more American Freds to do that. Wasn't he supposed to record something for you? Sven Friedrich = founding member of Dreadful Shadows in Berlin in the early 90s. Angelic Marissa Nadler--such a nice song. Reminds me of Amy Annelle. I first heard Amy Annelle on Irwin's show. Aug 26 2009 there is a wonderful live set with this unique folksinger, most of which is on the FMA. In fact you can celebrate that live set's 2nd anniversary! "Heart Paper Lover" was on last week, I liked that one too though it had more production than this solo set. Ah, the pedal on a 12-string. That was almost like double tracking. World premieres, on Dark Night of the Soul! Who's the engineer on that session? He did Eliza's as well. Hi all, greetings from holland where the rain is hammering down right now. Marissa's tunes floating wonderful together with all the water streaming everywhere. As well as all of Brian Turner's sets lately. I agree, he's awesome. Hi Maja! Wonderful imagery, glad you could listen to Marissa in that rain! I agree about the awesomeness. I really have to leave now, there's a fine line between late and AWOL. bye Fred thanks for stopping by! Maja we recorded this on a very rainy day. It was perfect. Try mixing the 12-string ones like that, they would work great with echo/delay. Ernie also engineered for the sisters from Fanny on Surface noise this week. We keep him very busy! gotta go to a meeting soon, drat ! I sort of love it when someone so talented can sound so shy and modest in an interview. Wooo! Go Ernie Indradat! A true resource of WFMU! Love this "L. Cohen" song. Marissa sings it well, so ethereally, and that swoony theremin-like organ makes it even more dreamy. I just get caught up in this hypnotic version! And a fade out before the traditional "Sincerely, L. Cohen" ending. That was a good decision--a wake up to the dream! And for the record she sang the American "without" (instead of "with-OAT"), and though I was listening for it, it's so nice and hypnotic I wouldn't have noticed if I wasn't TRYING to spot it! Wow, at the rate you're going I'll have to bookmark this Archive for a cold and rainy day! CELESTA!!!! Cha-les-ta, or Se-les-ta, this is a wonderful one, even if it's Tuesday Morning! @OD: It's a fantastic album though, always worth re-exploring! @Julie: That's the problem with really cool, obscure keyboards. Harpsichords also run pretty expensive. yes I loved Marissa so much I forgot to take her out of the cd player. Bonus! "There Was A Time" from Gift From A Flower To A Garden--ROCKIN harpsichord! Nice dulcet program this morning. Perfectly suited for my drained energy level. It almost sounded like a remix at first, is this a remastered? @hamburger: Yes! I'll hold him to it! ANOTHER DAY!! Peter & Kate from her 1979 Christmas Special!! Wonderful selection for this morning! Written by Roy Harper, also sung by Liz Fraser on the first This Mortal Coil album. Yep I know TMC's too. Birthday request from listener Van. I've always loved that "Rockin" harpsichord at the verse endings! thank you! Yay for Spotify! And I so love donovan, glad you played this. Don't let Clay listen to the Herman's..he'll be talking like Peter Noone all day! The Kinks! Harpsichord! "Her Sister" is another fab one. "DIGITAL BLUNTNESS!" It's what all the kids are doin'! Oops, sorry, that was just my stream going out! Matt - same happened here. Interesting visuals to go with the lyrics. i missed you during my (to short) holidays ! Bonjour, et au revoir! See you later maybe! Thanks Julie, this was a show for the ages! Awesome show Julie! Thank you so much for the birthday request "Another Day"! And thanks Matt from Springfield! Marissa was really great, thanks Julie. Nerdkween fit in so well with today's show, just as she did with Irene's! 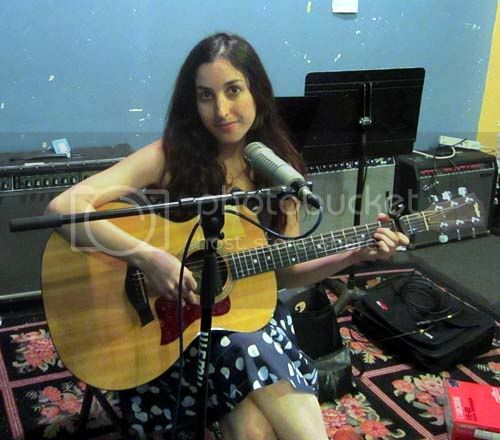 Marissa Nadler awesome beautiful! Thanks Julie,.! Lovely, lovely set by Marissa. Thanks Julie. Swooping into the past from the future to re-listen to the live Marissa set...she is performing in DC tonight and I hope to go see her!